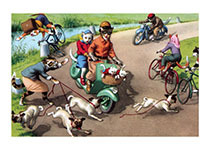 Riding a scooter is dangerous enough without a bunch of dogs running right in front of you! And that cat on the bicycle is in big trouble, too. The Hartung postcards were first published in Switzerland by Max Kunzli of Zurich, printed in continuous tone. From the 1940s through the 1960s, the Alfred Mainzer Company of Long Island City, NY published them in a series of linen and photochrome postcards. They were sometimes referred to as Mainzer Cats.These postcards normally illustrate settings that are filled with action, often with a minor disaster just about to occur. While the dressed cats were by far the most popular and most plentiful cards, Hartung also painted other dressed animals - primarily mice, dogs, and hedgehogs. Typically, the Kunzli cats are featured in European settings and the cards are not as brightly colored as the American editions. Later cards were printed in halftone lithography in a variety of countries, including Belgium, Turkey, Thailand, and Spain. Our prints are made at our location in Seattle, WA. They have a thick, white backing board and are sealed in clear bags. Each is suitable for framing at 11 inches x 14 inches or can be used as is for wall display. Our goal is to bring back to life these wonderful illustrations from old-fashioned, children's books and from early advertising art.